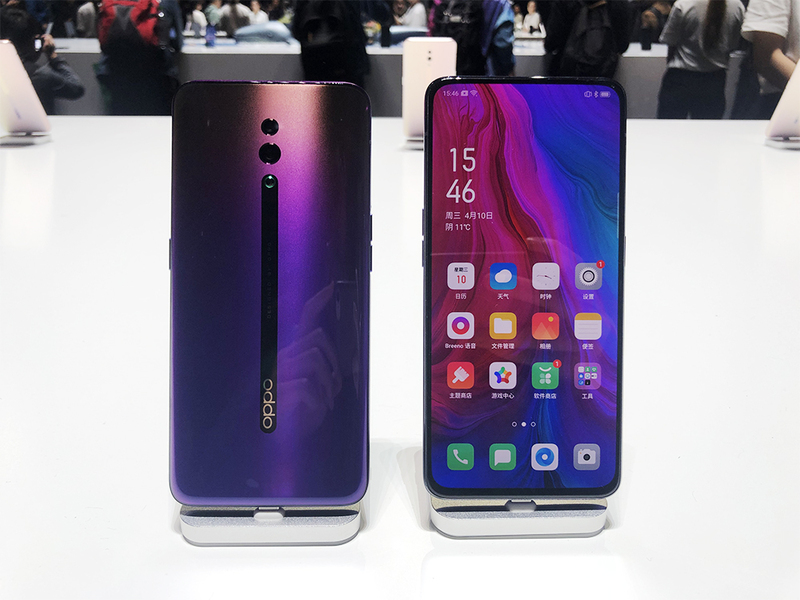 Oppo is somewhat of an underdog in the smartphone arena—a brand with products that are easier on the wallet while having good capabilities, but also one that can go unnoticed by users who are fixed on the hottest trends and top-in-market. With the launch of their new series, Oppo wants to change that. 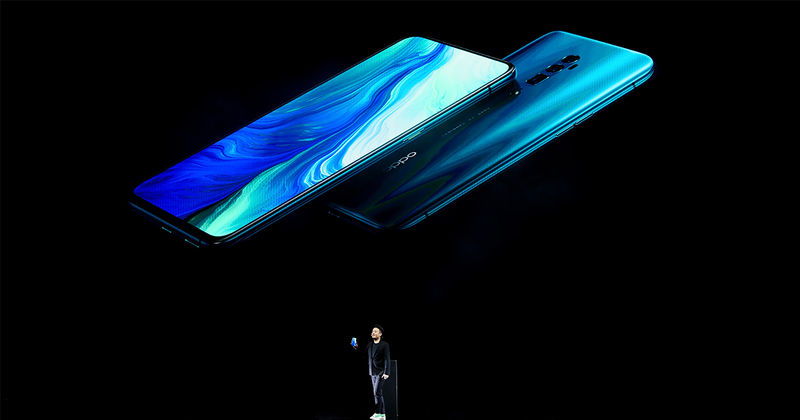 The Chinese firm’s Deputy CEO, Brian Shen, introduced their latest Reno series of phones in Shanghai on Wednesday, 10 April 2019. First of all, it’s pronounced “ree-no“, not “reh-no” as in “renovation”, and right off the bat, it wants to be a phone that fuels a creative generation. It comes in two ranges, the Reno, as well as the higher range Reno 10x Zoom. Here’s what we know from our first experience with the series. Going as close as possible to bezel-less is the aim nowadays, and Reno aces this. The phone keeps it slick with super thin bezels, achieving a 93.1% screen ratio. It also doesn’t contain a notch, which takes away any obstruction from fully enjoying its 6.4-inch and 6.6-inch OLED displays. 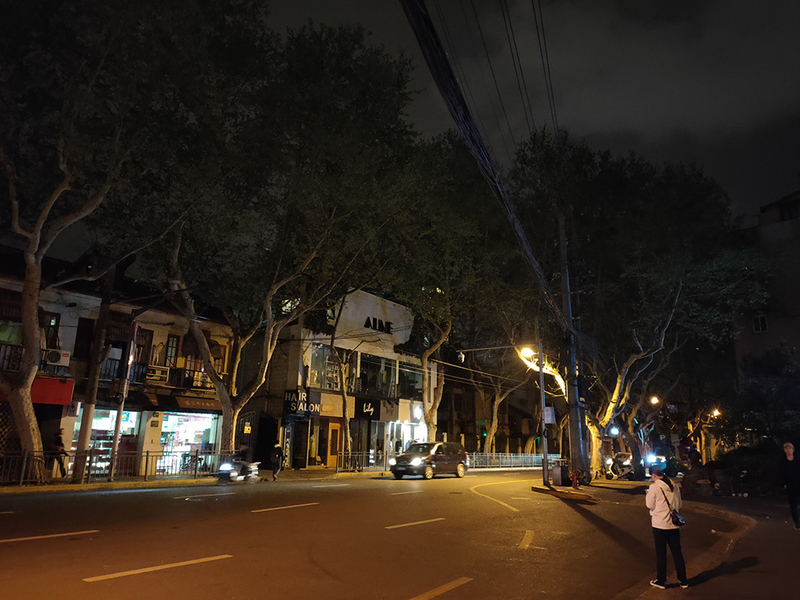 But no notch doesn’t mean no front camera—Oppo conceals this in a pop-up once again, as it has done before with their 2018 flagship, Oppo Find X.
Shen says Reno’s front camera, which slides up with a “side rotation elevation”, is designed to make an elegant motion, rather than having the snappiest speed at the expense of class. That said, it still only needs 0.8 seconds to appear when activated. Its fingerprint sensor, likewise, is hidden in-screen, and now uses a new algorithm and lighting system to increase unlocking speed by 28.5%. 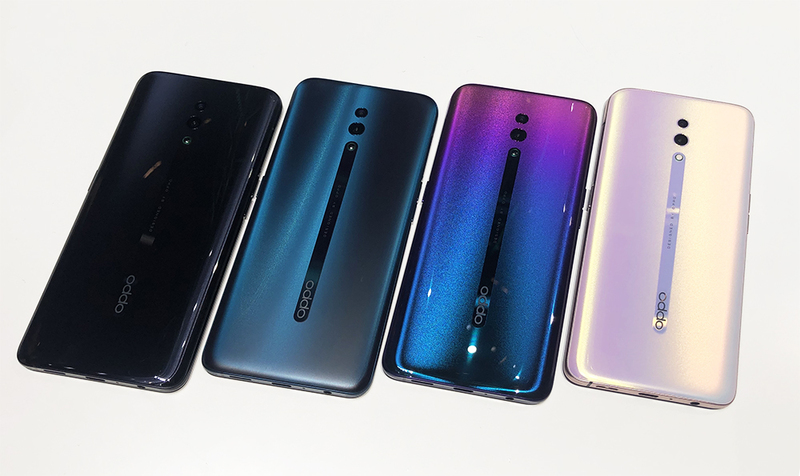 All this goes along to match the phone’s sleek body made of 6th generation Corning Gorilla Glass, coming in four 3D gradient colours: Jet Black, Ocean Green, Sunset Purple, and already a hit so far, Sunset Rose. In the camera department, the standard Reno is fitted with a 48 megapixel and 5 megapixel lens, but the Reno 10x Zoom really shines with its 3 rear camera set-up. This comprises a 48 megapixel lens with dual OIS optical anti-shake, an 8 megapixel 120º wide-angle lens, and a 13 megapixel telephoto lens. Both ranges of the Reno series come with a 16 megapixel front camera equipped with soft light, backlight, and an AI beauty feature for taking great selfies. Reno’s photographs are made more vivid with Dazzle Color Mode, an intelligent colour reconstruction solution that maps colours on pixel-level, while Oppo’s Artistic Portrait mode gives you professional looking bokeh. Good photographs are important to most people, and a common struggle is maintaining high quality in low light or when zoomed in, Shen said. 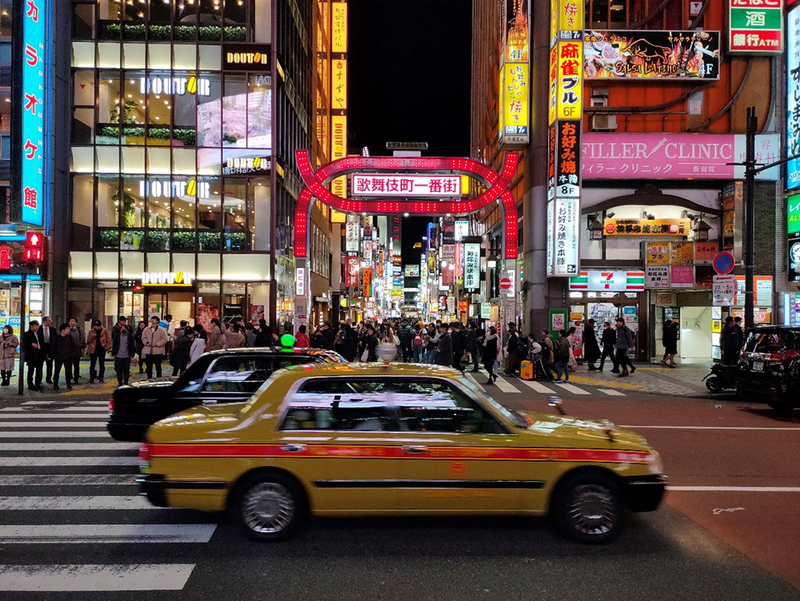 Reno 10x Zoom combats this with its upgraded Ultra Night Mode 2.0, that gives you clear low-light images through multi-frame noise reduction and HDR technology. Its AI engine also helps to reduce the processing time required for night scene photos to just 2 or 3 seconds. Ultra Night Mode 2.0 also prioritises “face protection”, so that people’s faces are distinguished and lit clearly from the background when taking portraits at night. Arguably the largest highlight, the Reno 10x Zoom is the first of its kind to offer 10x Hybrid Optical Zoom. This feature employs a periscope structure of lenses laid horizontally within the phone, that is able to adjust a long zoom without relying on digitally enlarging images. For a photographer, this means being able to shoot anything between a 16mm to 160mm focal length on the Reno 10x Zoom. You can adjust this when you use the ‘Expert Mode’, which also lets you control the aperture, exposure and white balance like you would with a DSLR. And if you create videos, the phone has the ability to shoot in 4K up to 60 fps too. Oppo also made the Reno series to be even better for mobile gaming. With Qualcomm Snapdragon 710 in the Reno, and Snapdragon 855 in the Reno 10x Zoom, the phones are intended to take on the most demanding of games. To take that on, the phones are cooled in three ways, using graphite sheets, Copper Pipe Cooling tech, and thermal conductive grease paste to control temperature. Its HyperBoost 2.0 smoothens the gaming experience, consisting of ‘Frame Boost’ that detects the system’s underlying graphics cache state in real time and allocates resources to match a game’s requirements, and ‘Touch Boost’ that provides 21.6% faster touch response time. While you play or watch movies, Reno’s audio experience is bolstered by the Dolby Atmos sound system on stereo speakers. Reno launches together with Oppo’s latest operating system. 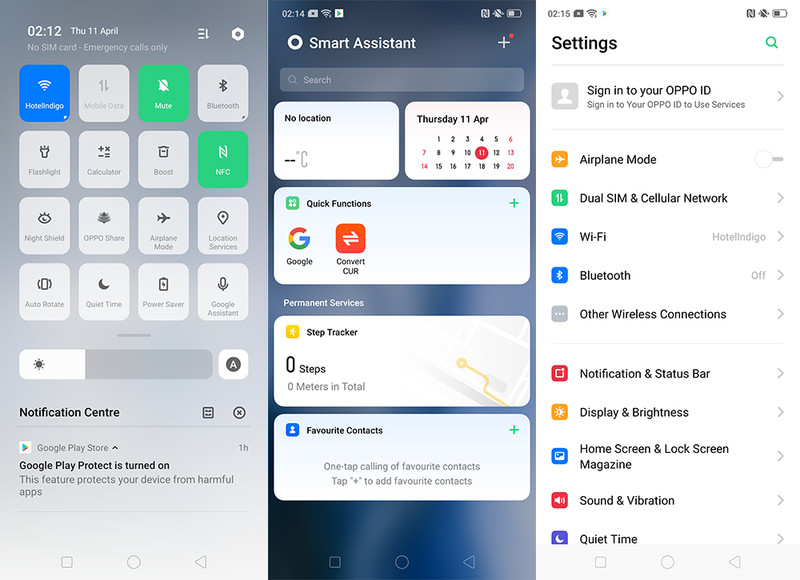 The ColorOS 6 does away with unwanted borders and looks a lot more minimal, slightly reminiscent of Apple’s interface in some aspects. The series also introduces ‘Breeno’ for the first time, a personal assistant much like Siri or Google, that can remind you about events you’re attending or flights you’ve booked, and more. 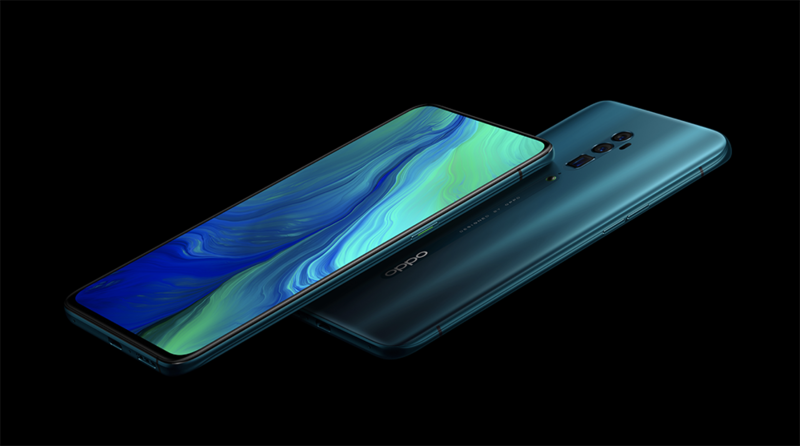 The Reno comes with a 3765mAh battery while the Reno 10x Zoom has a 4065mAh battery, both utilising Oppo’s VOOC 3.0 flash charging technology that’s supposed to make charging quicker by 23.8%. You can get the standard Reno with 6GB + 128GB/265GB, or 8GB + 256GB storage combinations. For Reno 10x Zoom, only the latter option is available. 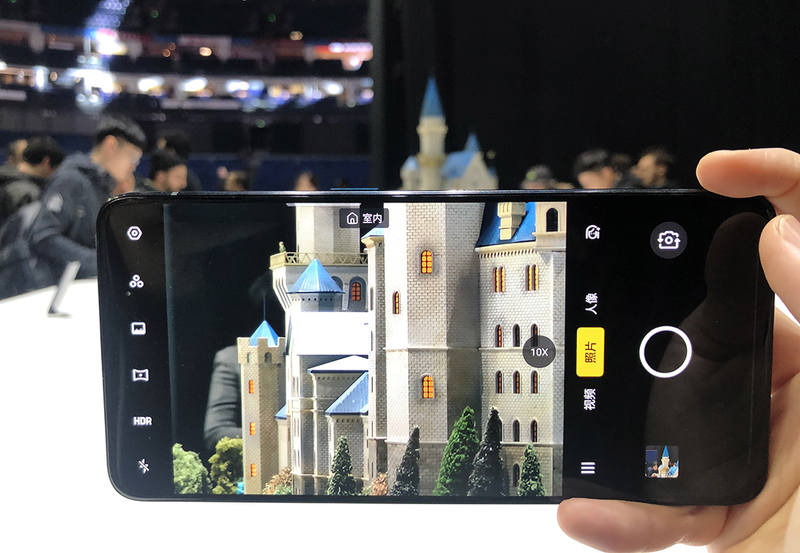 At the Shanghai launch, prices for the phones in China were announced, starting at 2,999 yuan for standard Reno range, which is approximately S$603 converted. But to find out the official pricing here, buyers will have to wait till Reno’s launch in Singapore, to be announced again at a later date.